In the photo above Ted Cruz is seen smiling and standing straightforward facing David Dewhurst. The opposite is true about Dewhurst. He is not smiling and his body is not facing Cruz; instead he is standing away, having to reach over to shake hands. 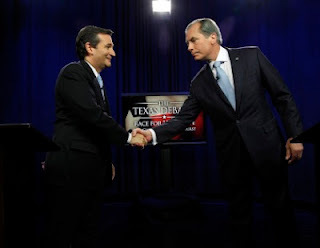 It is a very telling moment; it appears that Dewhurst is not willing to stand alongside grassroots favorite Cruz. As the July 31st run-off election date for the US Senate approaches, the attack ads will intensify. Again let me emphasize that politics is a ‘blood sport’ and makes for strange bedfellows. Anyone who does not understand this is in a fantasy world. The difference between the two candidates is that one is the established establishment politician and the other is the people’s grassroots fighter. Friday night’s debate was an excellent preview into how each candidate would handle himself on the Senate floor and how he would deal with the critical issues facing our America. If you want someone with passion, knowledge and absolutely no fear to address the issues, then it is Ted Cruz you want. If you prefer a more sedated and timid candidate then David Dewhurst is your man. Like chocolate and vanilla. The debate questions were on target; each candidate seemed to handle immigration in the same manner and neither support bail outs. They both believe that Social Security is broken, but Dewhurst had to be prompted for exact solutions while Cruz clearly enumerated his. When it comes to foreign policy, Cruz believes that we should use our US military might only to protect the vital national security interests of the United States of America. We should follow the Weinberger Doctrine with overwhelming force and a clearly stated objective and when we are through, get out, Cruz stated firmly. Dewhurst’s answer was more specific to Afghanistan and Iraq. He followed in step and listed the same reasons for going in to fight: vital security interests, overwhelming force and a clear exit strategy. Each candidate believes that Israel should be protected. The big difference is that Cruz says America should follow our Constitution and not the United Nations. There are 25 million Americans who do not have jobs and the answers to this problem differed. Cruz was enthusiastic and assertive and knew exactly what has to be done and how. Cruz made it very clear when he said, “We have a crisis in America and we need to stop Obama’s war on jobs.” I want to repeal Obamacare and I will lead the fight to repeal every word, stop the abuse in the enforcement of environmental laws, revoke the off shore drilling moratorium, stop the assault of right-to-work-states and repeal Dodd Frank. These Obama policies, he said, are boots crushing businesses that create jobs. Dewhurst was not quite as emphatic and answered by saying that Texas has cut spending, while DC has increased spending, I have helped cut taxes in Texas 51 times for a total of 14.6 billion on Texas businesses and taxpayers and DC wants to increase taxes. I have balanced five straight budgets without raising taxes and Harry Reid hasn’t balanced a budget in over three years. I have run TV ads against ObamaCare because it is bad legislation. I will move to repeal ObamaCare on my first day in the senate. So here we have two methods of approach, Cruz is willing to lead the charge to fight and put his soul and mind into what must be done while Dewhurst is willing to ‘move’ on the Senate floor and spend more money for TV ads to repeal ObamaCare. What works in Texas does not necessarily work in DC. Each candidate was given an opportunity to ask one another a question. This is how Cruz and Dewhurst questioned and answered each other. Cruz: Lt. Gov Dewhurst, you have been widely criticized for having proposed a statewide wage tax, a payroll tax that would have been 2.5% of the wages of every employee. Your response is to call your critics liars. So I have a very simple question, did you support a payroll tax? Yes or no and is that a good idea? Texas businesses will have a choice of paying either a low-rate revised franchise tax or a payroll tax. To protect small businesses, the bill maintains the current $150,000 no tax due threshold and will exempt sole proprietorships. To protect the neediest Texans, the bill offers a 20% sales tax rebate to Lone Star Card holders. As approved by the Senate, HB 3 will increase taxes on alcoholic beverages by 25%, and increase taxes on cigarettes by 75 cents per pack. Dewhurst: After college, you made a decision that you wanted to go to Harvard Law School and later you clerked for several judges and than went into the federal government as a staff attorney. After college I joined the USAF and during the Cold War I raised my hand and joined the CIA and I served abroad during some tough times. I came back and formed a business from scratch and built it up. What about your background do you think makes you more qualified to make you the next US senator? Cruz: What I believe that makes me qualified as a US Senator is I have spent a life time fighting for the Constitution and winning on a national level. I served 5 ½ years as solicitor general of Texas, the Chief lawyer for the state, in front of the US Supreme Court serving under Greg Abbott and over and over again we lead the nation defending the Constitution and defending conservative principles, whether it was the Ten Commandments or the Pledge of Allegiance or the Second Amendment or US Sovereignty standing up to the World Court and the United Nations and defending US Sovereignty, we need a fighter right now. And that is what I have spent a lifetime doing, fighting for the Constitution. The question on the Transportation Security Administration Texas bill has been a subject of contention to Texas voters and Cruz delivered his answer first. He said that he strongly opposes the TSA groping policy because it violates the rights of our passengers. He also mentioned that Israel targets terrorists while we look for guns because of our Political Correctness. Cruz asserted his claim that Dewhurst had killed the TSA bill because of the letter received from Obama’s attorney John E. Murphy. Dewhurst’s reply claimed that he worked with Senator Daniel Patrick to pass the TSA bill in the Senate. Unfortunately for Dewhurst there are many news media articles documenting otherwise. Ultimately the TSA Texas bill did not pass. Dewhurst said he would like to eliminate the TSA and privatize it. Each candidate was given a last chance to win the voters to their side. Cruz called Dewhurst a conciliator and frankly told the audience that if they wanted a ‘go along to get along politician’ then it’s Dewhurst they want, if they want a strong conservative fighter then vote Cruz. Dewhurst in his mild manner gave his life story and said that he had a heart to fight and that he is a fighter and that he had fought all his life. My question: if Dewhurst is such a great Lt. Gov for Texas than why is Governor Rick Perry working so hard to get him elected? Perry’s persistence with Dewhurst winning is mystifying. It has the media spinning and asking why. Personally, I see it as loyalty to a colleague and Perry’s need to have a friend in the Senate. Why did Patrick do a reversal on Dewhurst? Patrick is in a win/win situation. With Dewhurst out of the way, a strong conservative like Patrick could step in as Lt. Gov. If Dewhurst loses, there won’t be any retribution. Then everybody will be happy, right? Wrong, this is politics!